It wouldn't be (British) Christmas without roasted potatoes. They're crispy golden nuggets of love and I could eat an entire plate of them (which I almost did the moment I'd finished making this recipe...) I head home to Edinburgh tonight, so yesterday I got in the Christmas spirit by drinking an entire bottle of wine and making roast potatoes. I really should've spent the time packing but OH WELL. Since I wasn't making a full roast dinner yesterday, I didn't have any gravy to go with the potatoes, so I had to improvise. And, you know what they say, when you're out of gravy.... use yogurt? Okay, maybe no one says that, but they should because my yogurt, herb, créme fraîche concoction was delicious and the creamy dip went excellently with the crispy potatoes. For the fluffiest potatoes, you boil 'em and then shake 'em in a pot with some fat. Since my roommate and I have a jar of bacon fat in our fridge (yup), I used a dollop of bacon fat in this recipe but olive oil works great too. Goose or duck fat also work nicely. These are pretty classic tatties, but feel free to spice them up with a little paprika? Or you could finish the whole dish off with some sumac or za'ater? Preheat the oven to 450F. Peel and quarter the potatoes. Fill a pot with water, add the potatoes and a pinch of salt, bring to a boil. Boil the potatoes for 10 - 20 minutes or until they just begin to soften. Drain the pot and add a dollop of bacon fat. Put a lid on the pot and shake vigorously so all the potatoes get coated in fat. Place the potatoes on a roasting tray and season with salt and pepper. Roast in the oven until golden and crispy (approx. 45 mins), turning every 15 minutes or so. 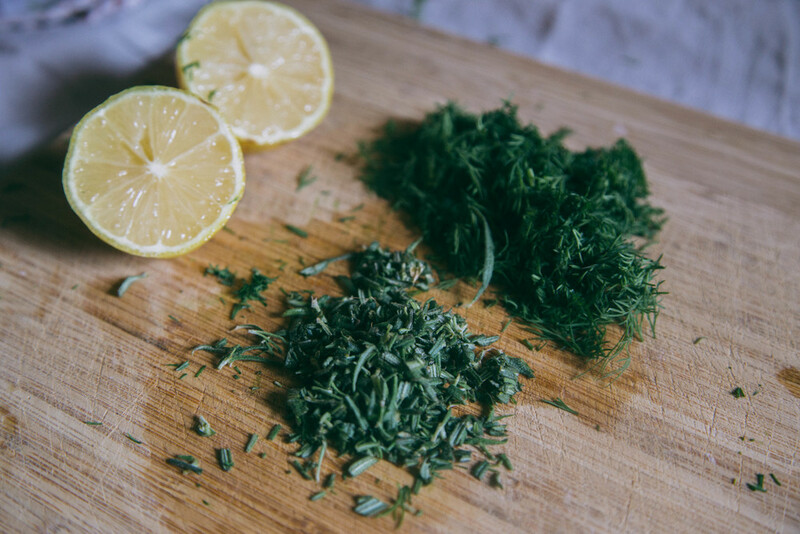 For the dip, finely chop the herbs, then mix all the ingredients together. Adjust the flavors to your liking and drizzle with additional olive oil to serve.